This volume assembles and presents a database on bank regulation in over 150 countries (included also on CD). It offered the first comprehensive cross-country assessment of the impact of bank regulation on the operation of banks, and assesses the validity of the Basel Committee's influential approach to bank regulation. The treatment also provides an empirical evaluation of the historic debate about the proper role of government in the economy by studying bank regulation and analyzes the role of politics in determining regulatory approaches to banking. The data also indicate that restrictions on the entry of banks, government ownership of banks, and restrictions on bank activities hurt banking system performance. The authors find that domestic political factors shape both regulations and their effectiveness. 1. Introduction: 1.A Motivation; 1.B Objectives and contributions; 1.C Key findings: a brief synopsis; 1.D Guide to the book; 2. Contrasting approaches to bank regulation: 2.A Two approaches to bank regulation: 2.A.1 Public interest approach; 2.A.2 Private interest view of regulation; 2.B Bank regulation: how; 2.C The Basel Committee and regulatory convergence; 2.D Conclusion; 3. How are banks regulated and supervised around the world? : 3.A Overview; 3.B Structure, scope and independence of regulation and supervision; 3.C What is a 'bank'? ; 3.D Entry into banking, capital requirements and supervisory powers; 3.E Explicit deposit insurance schemes; 3.F Private monitoring and external governance; 3.G Does bank ownership type affect the choice of regulations and supervisory practices? ; 3.H Forces for greater harmonization of regulation and supervision among countries; 4. What works best: 4.A Goals and boundaries; 4.B Bank regulation and supervision and bank development; 4.C Bank supervision, regulation, and stability; 4.D Bank supervision, regulation, and bank efficiency; 4.E Bank supervision, regulation, and bank lending; 4.F Supervision, regulation, and bank governance; 4.G Summary of results; 5. Choosing bank regulations; 5.A Recap and motivation; 5.B Motivating example: Mexico and the United States; 5.C Conceptual framework; 5.D Empirical framework and data; 5.E Summary remarks; 6. Rethinking bank regulation: 6.A Approach and context; 6.B Lessons and implications. 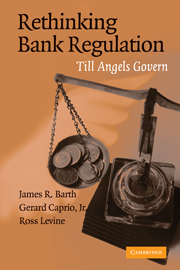 "...three economist, James Barth, Gerard Caprio and Ross Levine, have published a book...which analyses the attempts by governments around the world to make the banking system safe from calamities...."
"This volume presents a new database on banking regulations in more than 150 countries. It offers the first comprehensive cross-country assessment of the impact of bank regulation on the operation of banks, and assesses the validity of the Basel Committee's influential approach to the bank regulation."